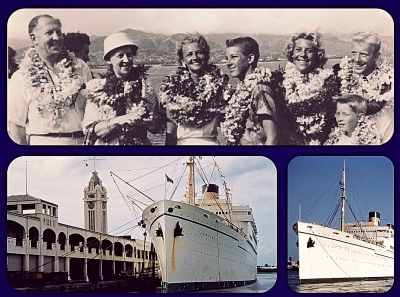 70 Years ago this week, Matson Line’s refurbished SS LURLINE sailed from San Francisco and Los Angeles on her maiden post-WW 2 voyage to Hawaii. 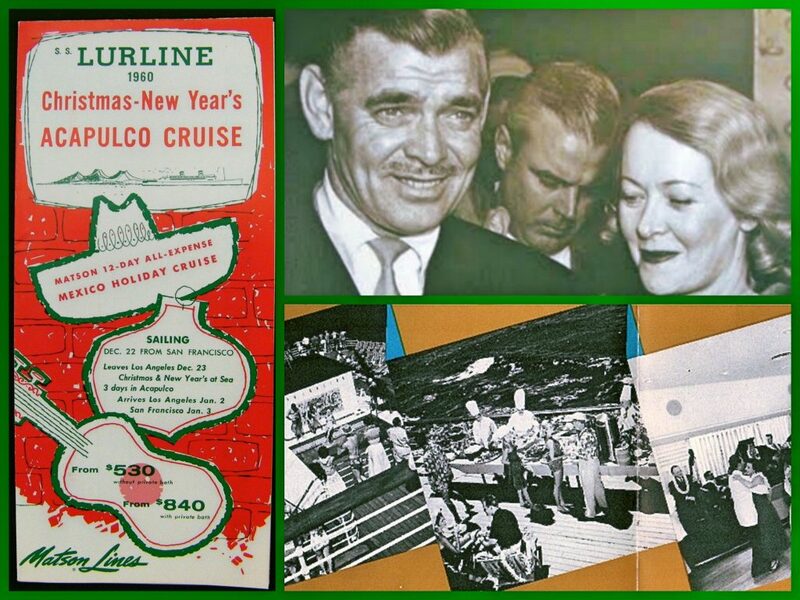 The Lurline sailed to Acapulco each Christmas; Clark Gable on the Lurline; Swimming, buffet lunch and dancing in the ballroom. 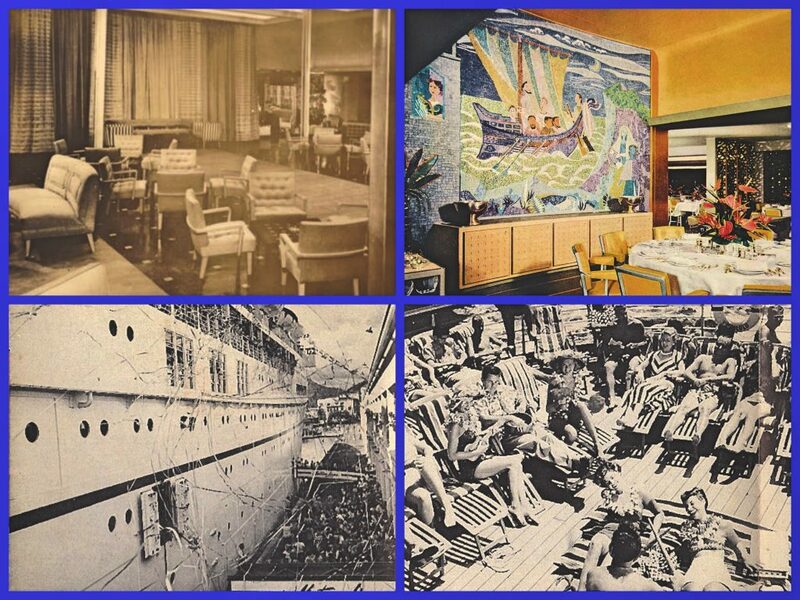 The Main Lounge for movies, bingo and lectures; The Coral Dining Room; Poolside Sun Deck: Sailing on the Lurline with streamers, bands and farewell parties. None of this exists today. 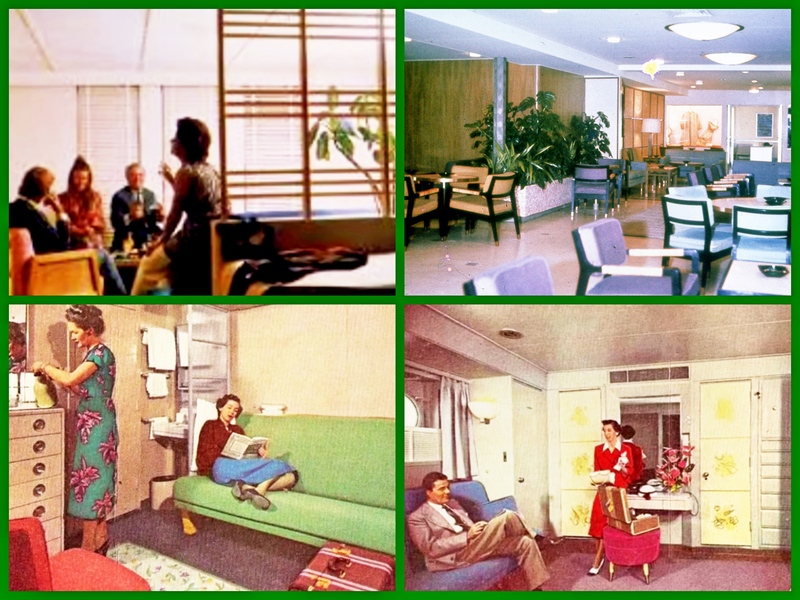 Cocktail Lounge; Lanai Suite; Card and Writing Room; Lounge. First Class dining on the Lurline. Dinner Menu. Lanai Suite; Lounge area; Outside Stateroom; Inside Stateroom. 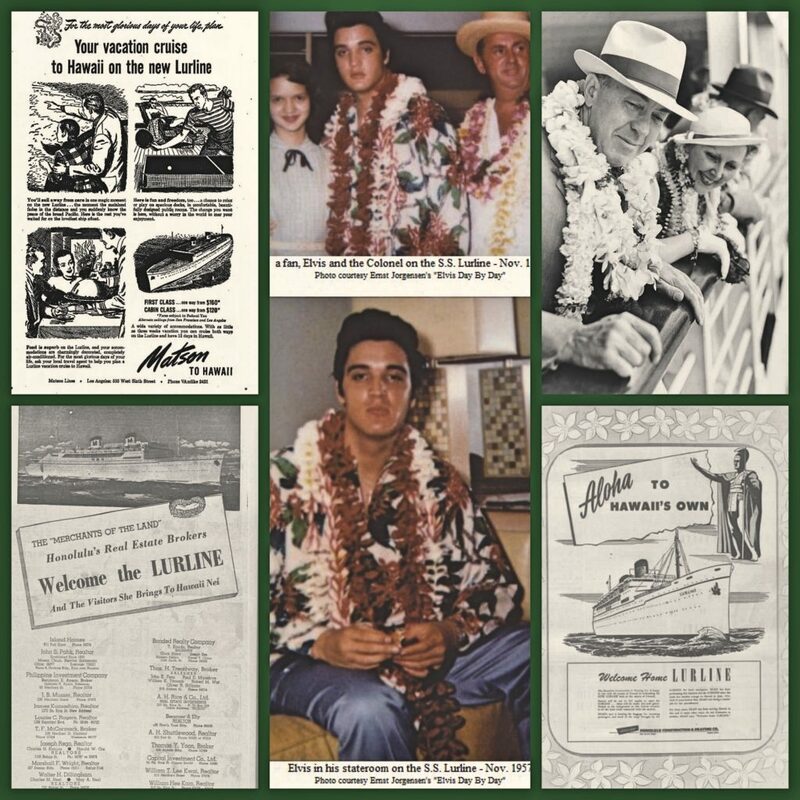 Ad for the new Lurline; Elvis on the Lurline; Sailing Day; Newspaper ad welcoming the Lurline; Elvis in the Lanai Suite; Welcoming the Lurline. 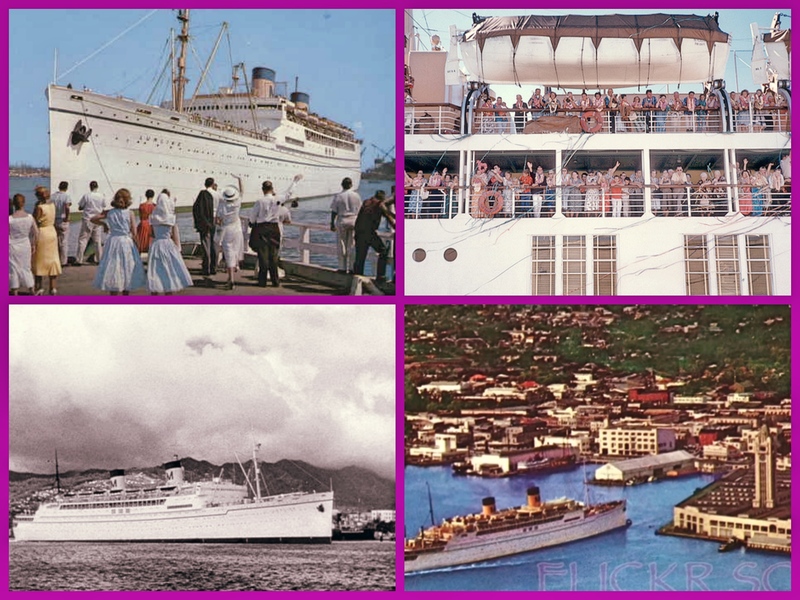 Scenes of the new Lurline sailing for Hawaii and arriving in Honolulu. The flagship of Matson’s passenger fleet had just emerged from a stunning $18-million makeover, following six years as a troop carrier with her white ship sisters, MARIPOSA, MONTEREY and MATSONIA. The Lurline was the Queen of the Pacific and her arrival in Honlulu was greeted with great fanfare. 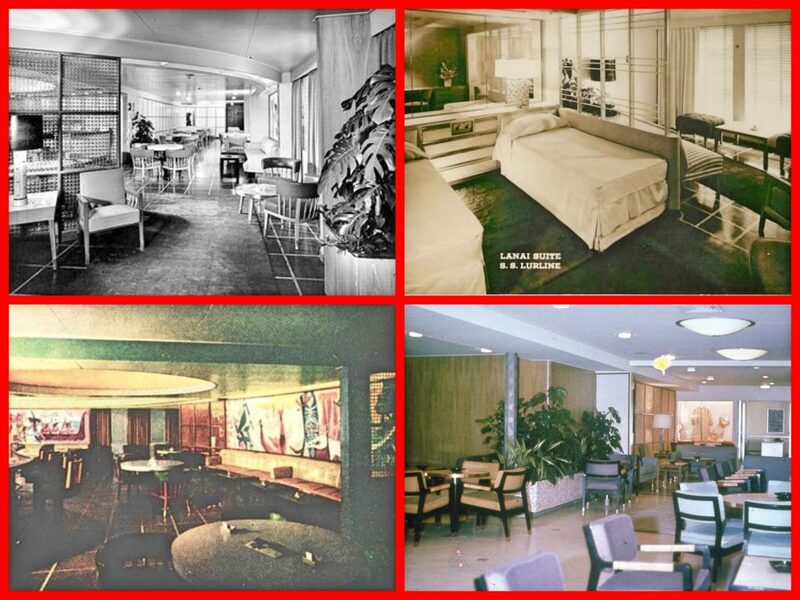 For her April 1948 debut, passengers were greeted with all new staterooms and public rooms, planned by Raymond Loewy, of New York, one of America’s foremost designers. 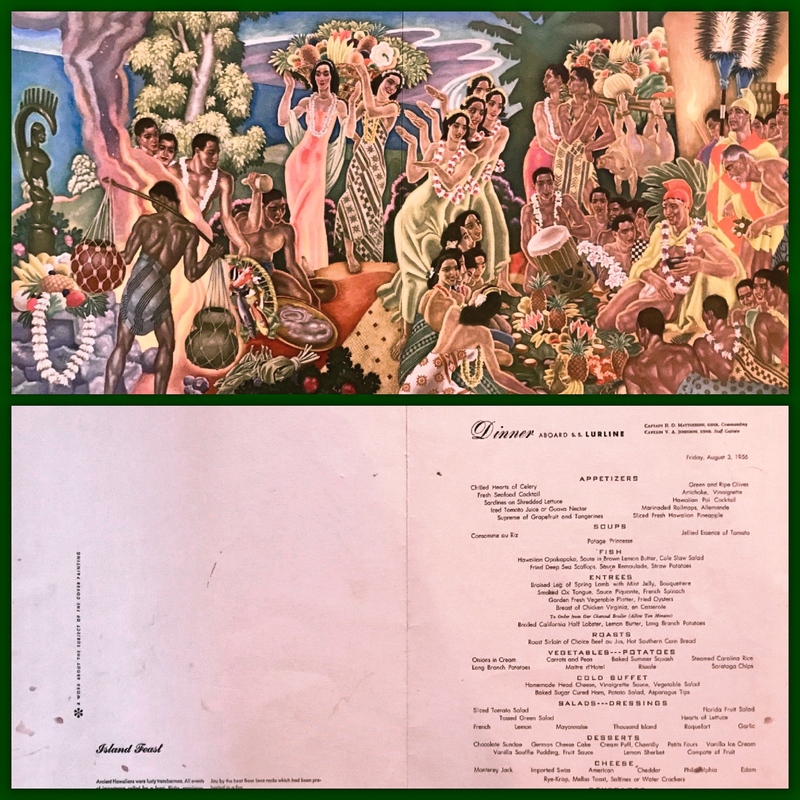 The smart LURLINE was legendary on the Hawaii run, offering warm hospitality and pleasant diversions on five days express crossings from San Francisco and Los Angeles to Honolulu. The time spent onboard was as much a part of a Hawaiian holiday as a day at Waikiki Beach. Movie Stars from Clark Gable, Janet Leigh to Elvis Presley would sail aboard the gracious big white ship until her retirement in the early 1960s. In the 1950s, a cruise to Hawaii was sailing round-trip from California to Honolulu (alternating between San Francisco and Los Angeles) on Matson Line’s SS Lurline. The first class ship made the crossing in 4 and 1/2 days. Most passengers spent 9 days in Hawaii before returning to the California major cities. It was an American flagship with an all American crew. SS Lurline was the third Matson Lines vessel to hold that name and the last of four fast and luxurious ocean liners that Matson built for the Hawaii and Australasia runs from the West Coast of the United States. Lurline’s sister ships were SS Malolo, SS Mariposa, and SS Monterey. Here’s some fabulous unidentified color footage of a festive sail away aboard the SS Lurline, leaving San Francisco for Hawaii in what looks like the early 1960s. Here’s a question for you viewers… how did the photographer manage to film the ship leaving the dock… and then get aboard?! Have fun! Rechristened in 1963 by Chandris Lines as the MS Ellinis, the ship became one of the most important luxury cruise ships on the Australian and New Zealand services. She operated in Australasia and Oceania until 1980. SS Lurline sailing from Los Angeles in the 1950s. Previous: On the threshold of fame, ELVIS PRESLEY took the train from New York to Memphis in 1956. Next: New York’s 20th CENTURY LIMITED – the greatest train in the world!